This nautical-inspired handmade jewelry shop is everything that summer is about – just a look through the collection gives you all of the beach feels you can get. 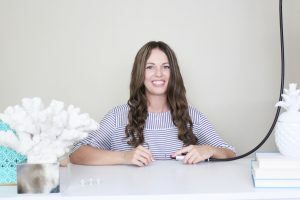 From simple wave bracelets to more detailed feather rings, every piece quickly becomes a summer staple that can be layered upon, or left to star on it’s own. 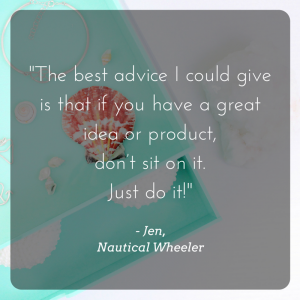 We want to share the story behind Nautical Wheeler, the shop focused on beach jewelry wear. Let’s get to know Jen and the story behind the Nautical Wheeler (visit the aftcra shop here)! Hi, I’m Jen from Nautical Wheeler Jewelry (shop here) and I handcraft nautical and beach inspired jewelry for mermaids and gypsy souls. I live in New England and work from home. I think it’s especially important that when you work from home, you make your office a place you really want to be. 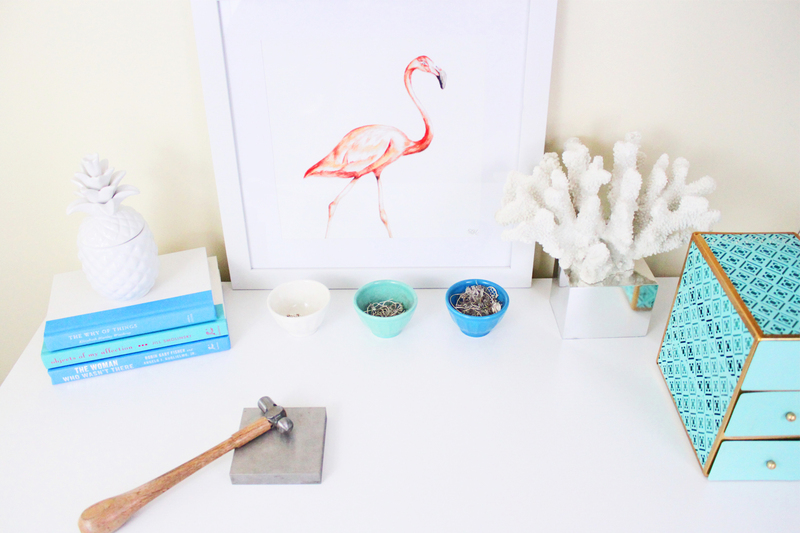 I’ve filled my office with pieces that inspire me and remind me of the beach. I always keep seaside treasures nearby, like seashells and driftwood, just in case I need a little added inspiration. What is your background? How did you get started in your line of work? I’ve been doing metalwork for 4 years but jewelry making for well over 10 years! I’ve been very lucky to have family in the jewelry industry. I studied metalwork under my aunt who was a goldsmith for over 40 years. 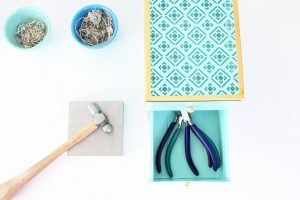 I taught myself other kinds of jewelry making skills, like knotting techniques and beading but found my true passion in metalwork. My process starts with an idea. Sometimes it’s easy to bring an idea to life, other times it takes several rough drafts before I get it looking the way I pictured. 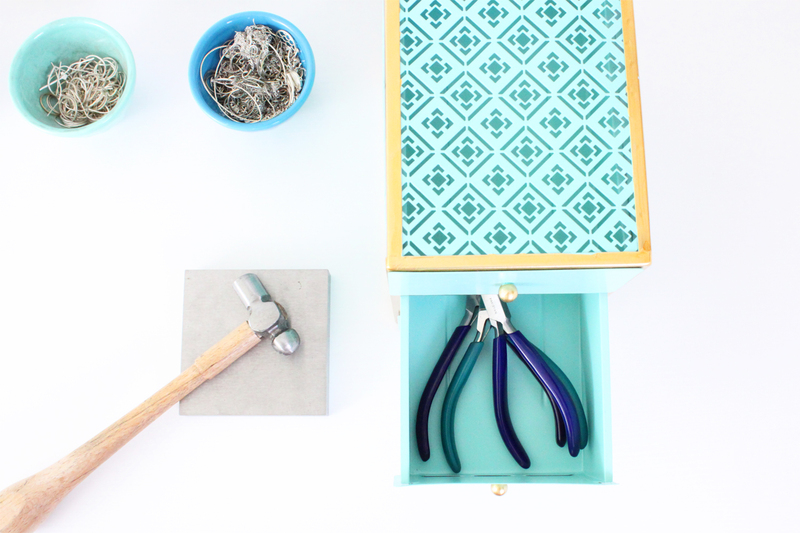 I usually start by either hand-sawing a sheet of Sterling silver or balling small pieces of silver together. The item is now just a soft notion of what I want it to be. So I’ll go in with metal filers and a variety of shaping tools to add details and get rid of sharp edges. From there it really depends on what type of jewelry I want the piece to be. If it’s going to be a ring, I’ll handcraft a Sterling band using a torch and solder to attach the two pieces. Next the ring will go through a series of cleaning and polishing until I get it just right. That’s when it’s ready to be wrapped and sent off to one of my lovely customers. I grew up in Vancouver and spent every Summer on Vancouver Island. There wasn’t a day in my childhood when I couldn’t smell the salty air, that I wasn’t rummaging on the beach for seaside treasures or out on a boat with friends. I never lost my love for the sea as I grew up and I still find myself drawn to its sandy shores. It’s hard to pinpoint exactly what inspires me about the beach. There’s so many different textures and colors, that I always feel like there’s some new form of inspiration. Whether it’s sea glass tumbled by the waves, the glistening water or a small feather found in the sand. What is your next new exciting project? I’m planning on doing new designs for Fall/Winter using coastal enamel colors and organic shapes. As soon as the new collection is ready, I’ll be putting it up on Aftcra so stay tuned! As a small business owner, what is one piece of advice you would share with other small business owners? 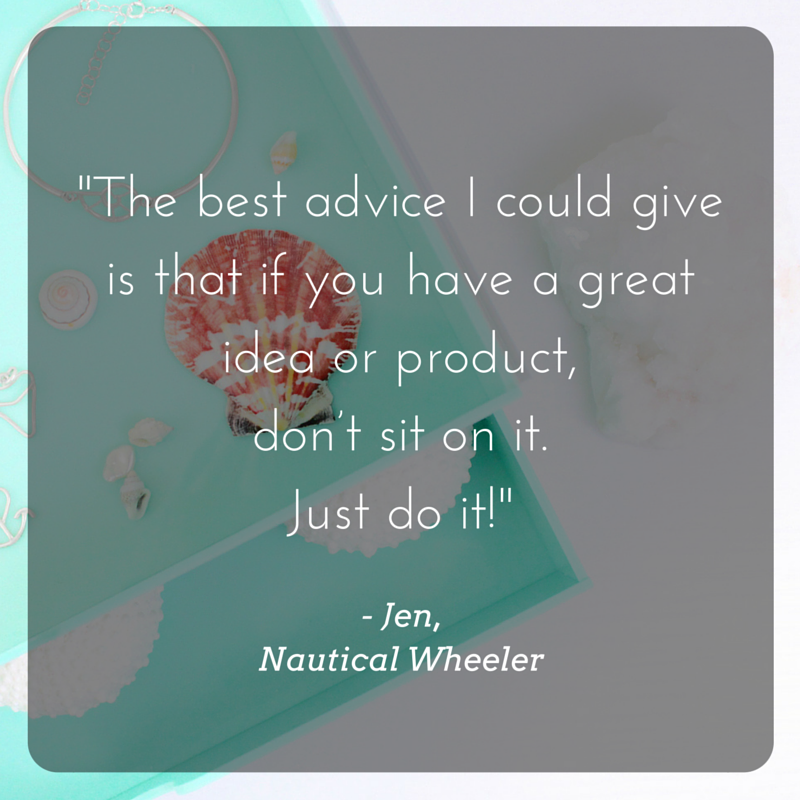 The best advice I could give is that if you have a great idea or product, don’t sit on it. Just do it! I thought about creating Nautical Wheeler Jewelry for a year before I finally decided to test the waters. This has always been my biggest regret. There is only so much research you can do, only so many people you can talk to and only so many business plans you can write. At the end of the day you just need to get out there and show people what you’ve got. What is a quote that you personally live by, or you have shared with others for inspiration? What handmade-related business resources do you use to help improve your business? Earlier this year I started taking classes on Skillshare. I had read about it from an article in Inc Magazine (another great resource!). I wanted to increase my presence on Instagram and took every class Skillshare had to help figure out what I was doing wrong. A few months later I went from having 60 followers to over 900! I was elated and not just because my follower count had increased, but because I finally felt that my Instagram account reflected the story I was trying to tell through my jewelry line. Why did you choose to join aftcra, and what do you enjoy about the community? I love that Aftcra features products handmade in the USA. I think it’s so important to know where your purchases come from and how they’re created. Aftcra really lets you reach out to the creators of products. It’s people dealing with people and I love that! What does “handmade” and “handcrafted” mean to you? Handmade is an endearing term meaning something that is created from the heart. Everyone should own something handmade, even if it’s just one thing. There’s something special about handmade items that you can feel when you hold them. I think that something special is love. With every piece of jewelry I make, I like to think I send out a little bit of love with it. I think that’s something everyone deserves to have. Want to get featured on aftcra’s homepage! Interested in becoming aftcra’s Featured Store of the month? Send an email to info@aftcra.com and we will send you the requirements. All requests will be considered to become the next aftcra Featured Store. 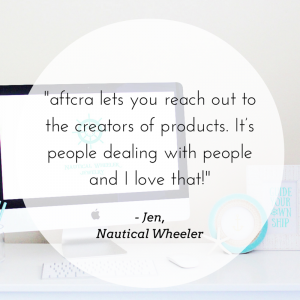 Have you checked out aftcra yet? 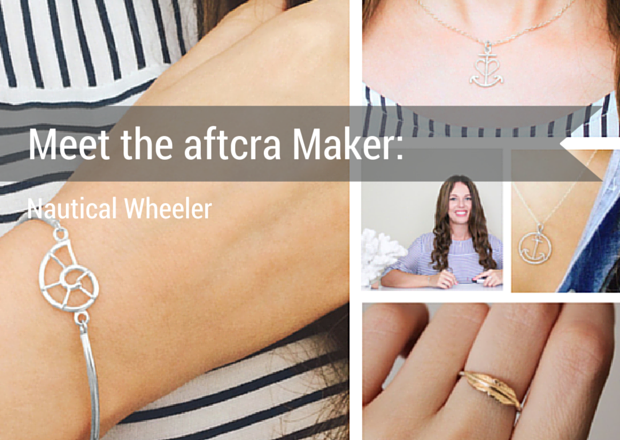 Discover handmade goods from American artisans at aftcra.